Meets August 27, Meets the second and fourth Monday of each month at 4:00 p.m., 100 N.
how to run, visit: LAVote. and blues, jazz and Dixieland. Thursday August 16 at 6:15 p.m.
Tuesday August 21 at 6:30 p.m. 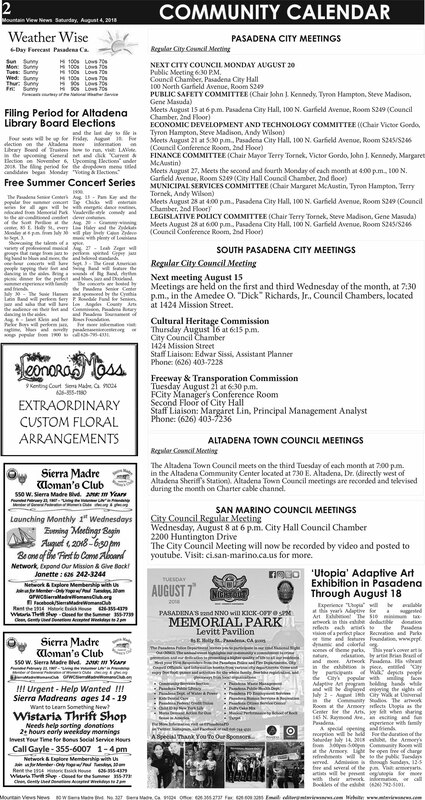 The Altadena Town Council meets on the third Tuesday of each month at 7:00 p.m.
during the month on Charter cable channel. youtube. Visit: ci.san-marino.ca.us for more. !!! Urgent - Help Wanted !! !